During the week of Yom Hashoah (Holocaust Remembrance Day), the Conference on Jewish Material Claims Against Germany (Claims Conference) released the results of a comprehensive national survey of Holocaust awareness and knowledge among adults in the United States. The survey found that there are critical gaps both in awareness of basic facts as well as detailed knowledge of the Holocaust, and that there is a broad-based consensus that schools must be responsible for providing comprehensive Holocaust education. In addition, a significant majority of American adults believe that fewer people care about the Holocaust today than they used to, and more than half of Americans believe that the Holocaust could happen again. Nearly one-third of all Americans (31%), and 41% of millennials, believe that fewer than two million Jews were killed during the Holocaust, as opposed to the six million Jews who were killed. While there were more than 40,000 concentration camps and ghettos in Europe during the Holocaust, almost half of Americans (45%) cannot name a single one, and this percentage is even higher among millennials (49%). At the same time, there are encouraging notes in the survey. In particular, there are key findings underscoring the desire for Holocaust education. More than nine out of 10 respondents (93%) believe all students should learn about the Holocaust in school and 80% of respondents say it is important to keep teaching about the Holocaust so it does not happen again. The findings show a substantial lack of personal experience with the Holocaust, however, as most Americans (80%) have not visited a Holocaust museum. Material Claims Against Germany. Data were collected and analyzed by Schoen Consulting with a representative sample of 1,350 American adults via landline, cellphone and online interviews. Respondents were selected at random and constituted a demographically representative sample of the adult population in the United States. For more information, visit claimscon.org/study. Jacques Lewin, a Jewish physician in Paris, was arrested at the end of 1941 and was sent to Auschwitz on the very first convoy from Western Europe to that notorious death camp. His profession almost certainly saved his life, as he performed a role that the Nazis deemed useful: that of a prisoner-doctor. Lewin’s daughter, Claude Romney, has studied the Holocaust experiences of prisoner-doctors like her father and has a forthcoming book on the subject. She will share her family’s story, and illustrate aspects of the experience of prisoner-doctors, as the keynote speaker at this year’s Yom Hashoah Holocaust Commemorative Evening, which takes place April 23, 7 p.m., at the Jewish Community Centre of Greater Vancouver. Lewin’s arrest took place two weeks after Romney’s third birthday. She and her mother, Saya, survived the war in Bagnères-de-Bigorre, a small town near the Spanish border that was occupied by the Germans less than three months after they arrived. Romney’s presentation will begin with some context about the state of French Jewry in the early part of the war, something she said is not as well known as it could be. She will share a bit about her and her mother’s experiences during the war, then turn attention to her father’s story. Years after her father passed away, Romney’s mother gave her a file containing documents from her father’s past, including a few articles he had written immediately after he returned to France after the war. These had been published in a newsletter distributed by the French resistance and never reached a wide audience. Romney has obtained the transcript of the testimony her father gave at the 1947 trial of the Auschwitz commandant Rudolf Höss, but it is not comprehensive. However, other prisoner-doctors did write and testify. Romney’s forthcoming book, Saving Lives in Auschwitz: The Written Testimonies of Prisoner-Doctors, is based on the experiences of 60 individuals who survived and told what they witnessed. When Lewin first arrived at Auschwitz, he and the others in his transport were put to work constructing a new section of the camp – to be known as Birkenau. “If they had refused to obey orders outright, they would have sent them to the gas chambers too,” she said. After the war, Romney studied at the Sorbonne and became a professor of French linguistics and literature, first in Toronto, then Sudbury and finally Calgary, before retiring to Vancouver. She and her husband, also an academic, thought Canada seemed an ideal place since he was English and she was French. The annual Yom Hashoah evening is presented by the Vancouver Holocaust Education Centre (VHEC). It is supported by the Gail Feldman Heller Endowment and the Sarah Rozenberg-Warm Memorial Endowment Funds of the VHEC, and funded through the Jewish Federation of Greater Vancouver annual campaign. In addition to Romney’s keynote address, the evening will feature cellist Eric Wilson, Yiddish singer Myrna Rabinowitz, Cantor Yaacov Orzech and the Kol Simcha Singers. Artistic producers are Wendy Bross Stuart and Ron Stuart of WRS Productions. Holocaust survivors are invited to participate in candlelighting. Dr. Peter Suedfeld has devoted his life to the study of how human beings adapt to and cope with challenge, stress and danger. Yet it was many years into his work that he acknowledged his choice of academic pursuit may be related to his personal life history as a survivor of the Holocaust. Suedfeld, professor emeritus of psychology at the University of British Columbia, will deliver the keynote address at the Vancouver Holocaust Education Centre’s community-wide Yom Hashoah commemoration at the Jewish Community Centre of Greater Vancouver on May 4. Through the years, he has often been asked if his research was influenced by his family’s experience in the Holocaust. His mother was murdered at Auschwitz; his father survived Mauthausen. Suedfeld was a hidden child in Budapest, living as a Christian in an orphanage run by the International Red Cross. His early work focused on sensory deprivation, looking at how removal of external stimuli affects things like cognition, studying astronauts, cosmonauts and people who work in polar research stations. At the Yom Hashoah event, Suedfeld will reflect on his personal experience, discuss the Holocaust more broadly and then address the issue of the long-term adaptation of survivors of the Holocaust, a topic on which he has conducted a series of studies. Suedfeld has reviewed the psychological reports written soon after the war about the long-term potential of survivors to survive and thrive. Reviewing the early literature and knowing what he knows from personal experience and acquaintance with many survivors, Suedfeld is more surprised by the early negative prognoses than by the remarkable resilience of survivors. Suedfeld also cautioned that every experience of survivors is unique. Pat Johnson is a communications and development consultant to the Vancouver Holocaust Education Centre, as well as a member of the Independent’s editorial board. This article first appeared in the VHEC publication Zachor. Dozens of Vancouverites who survived the Holocaust were joined by their children, grandchildren and hundreds of others in a solemn, powerful commemoration for Yom Hashoah, Holocaust Remembrance Day. The catastrophic impact of the Holocaust on individuals, families, communities and the world was made evident through words and music, as stories of survival and loss, and their impacts on the living, were interspersed with Yiddish songs that recalled the civilization destroyed by the Nazis. 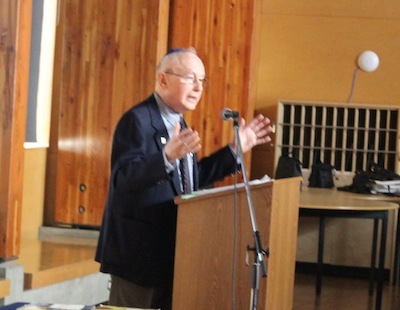 The annual event took place at the Jewish Community Centre of Greater Vancouver on April 15, the eve of Yom Hashoah. A procession of Holocaust survivors passed through the hushed auditorium, taking their places at the front of the hall and placing candles on a table before Chazzan Yaacov Orzech led the Kol Simcha Singers in a poignant El Male Rachamim, the prayer for the souls of the departed. Chaim Kornfeld led the room in the Kaddish. Hymie Fox, a member of the second generation, told the audience that his parents, Jack and Freda Fuks (Fox), struggled to keep their experiences from their children, but the Holocaust permeated the family’s life in unanticipated ways. “During the day, my mother could control her thoughts, her words, her stories,” Fox said. But at night, he would be awakened by his mother’s screams. He wanted to ask about the trauma that caused the night terrors, he said, but his mother had devoted herself so completely to sheltering these memories from her children that to inquire would suggest that all her efforts to protect her children were for naught. Fox’s father came from an extended family of more than 70 and was one of 11 children. Just Jack and one brother survived. Though unspoken, his family’s Holocaust experience was especially present at holidays, when the small family of four would celebrate alone. Kornfeld was the survivor speaker for the evening. He recalled his childhood in a village on the Czechoslovakian-Hungarian border, his early schooling and the strict adherence to Judaism with which he was raised, one that forbade the touching of an egg laid on the Sabbath until after sundown. In March 1944, when the Nazis occupied the town, they rounded up the intelligentsia, Kornfeld assumes because it would be easier to control the masses if the heads of the community were removed. A ghetto was established for the surrounding areas and, inevitably, Kornfeld was loaded onto a train car destined for Auschwitz. An older inmate pointed out Josef Mengele and warned the young Kornfeld to tell the evil doctor that he was 18 years old and a farmer. A week later, Kornfeld was transported in a railcar destined for Mauthausen that was so packed people could only stand. Mauthausen-Gusen concentration camp was a huge constellation of slave labor facilities, intended for the most “incorrigible political enemies of the Reich.” There, Kornfeld was put to work digging caves in a mountain where the Nazis constructed munitions and equipment, unassailable by Allied bombing. At one point, he developed an abscess on his leg and was unable to walk. He was taken to the infirmary, which was an extremely dangerous situation in a dystopia where only those capable of work survived. One day, all patients capable of walking were ordered to leave the infirmary and a Polish man carried Kornfeld on his back, fearful of his fate should he remain in the infirmary. A German soldier ordered the man to put Kornfeld down. The officer put his hand toward his holster. He reminded the Nazi how effective he was as a worker and his life was spared. He was liberated from Mauthausen on May 5, 1945. After a time on a kibbutz in Israel, Kornfeld came to Canada and learned of an opportunity as a Hebrew school principal in Saskatoon that allowed him to work evenings and study at university in the daytime. He became a lawyer, married and has four children. Claire Klein Osipov sang and interpreted Yiddish songs that, while often melancholy in themselves, had added resonance as evidence of the people, culture and language that were almost completely extinguished in the Shoah. She was accompanied on piano by Wendy Bross Stuart who, with Ron Stuart, artistically produced the event. The Yom Hashoah Singers – a group of Jewish young people including members of the third generation – delivered a message of both mourning and hope with such songs as “Chai” and “The Partisan Song,” the defiant anthem of Jewish resistance that is an annual tradition on this day. Lisa Osipov Milton also sang, and Andrew Brown, associate principal viola with the Vancouver Symphony Orchestra, performed excerpts from Milton Barnes’ Lamentations of Jeremiah and Ernest Bloch’s Meditation. Corinne Zimmerman, a vice-president of the Vancouver Holocaust Education Centre, which presented the event with support from the Jewish Federation of Greater Vancouver, the Jewish Community Centre and the Province of British Columbia, also spoke. “Yom Hashoah is not only about learning from history, but about passing those lessons on to the next generations,” she said. In the past several weeks, we have celebrated liberation and redemption on Passover. On Yom Hashoah, we mourned the victims of Nazism and the generations that never were. On Yom Hazikaron, we honored the brave defenders of Israel who gave everything for the dream of the Jewish people’s right to live as a free people in our own land. Then we joyously celebrated the realization of that dream on Yom Ha’atzmaut. These four commemorations are drawn together in many ways by rabbis and thinkers. We are mere journalists, but if you give us a moment, we, too, have some thoughts that may be worthy. There is a troubled narrative connecting the Holocaust and the creation of the state of Israel, a connection that is sometimes misunderstood and often deliberately misrepresented. Critics have called Israel a “reparations payment” given to the Jews as recompense for the Holocaust. This formulation is a desecration, because there could be no recompense for the Holocaust. More to the point, it is false history. Israel was not given to the Jewish people. The Partition Resolution, significant as it was as a fulcrum for historical events, turned out to be another hollow United Nations vote. Israel came into being only because the Jews of Palestine, some from the Diaspora and a small group of idealistic non-Jews from abroad fought – some to the death – for the dream of a Jewish homeland. The connection between the Holocaust and the creation of the state of Israel is not, as the popular narrative has it, because the world felt sympathy. If anything, the world wanted to create a place for the surviving remnant so that they wouldn’t have to take responsibility for them. Where the genuine connection lies between the tragedy of the Holocaust and the joy of independence is in the realization that the Holocaust was a direct result of Jewish statelessness. Had Israel come into being a decade earlier, there may have been no Holocaust, or its magnitude would have been much diminished. That is one connection. Another is the psychological effect the creation of the state had on Jewish people individually and collectively, in Israel and in the Diaspora. After the Holocaust, the Jewish people worldwide could have been expected to plummet into individual and collective despair. Instead, Israel gave hope – and a future to imagine and to build after the collective future was almost destroyed. Whether Jews made aliya – or even visited – or not, Jewish Canadians helped build the state of Israel through a million acts of philanthropy and volunteerism. Israel is many things to many different Jews. It is a resolution to 2,000 years of statelessness, the fundamental fact that was at the root of our tragedies. It is the culmination of the quest for sovereignty and freedom and, while Israel is not perfect by any stretch, we endeavor to work toward that ideal. Israel is the dream for which so many have given so much, as well as a complex, thrilling, sometimes infuriating, always cherished reality. In the context of millennia of Jewish civilization, the comparatively new state of Israel is a part of all of us and we are all, in some way, a part of it.